Jane Austen’s novel Pride and Prejudice follows a complicated, yet compelling story about a family of five children, their parents and their love lives. The most prominent issue throughout the novel is that the five children are all female. In order to secure all of their comfortable futures, the children must marry affluent young men. In the 2003 Saddleback adaption, Janice Greene’s visual impression reduces the importance of wealth and prosperity, and increases the romance factor. This is evident not only on the front cover, but also on the back, where the series summary states; “Silly Mrs. Bennet is ‘husband hunting’ for her five daughters…Darcy would make a great match for Elizabeth–if it weren’t for his false pride and her stubborn prejudice. And the other girls aren’t cooperating. Jane is too shy to show affection, and Lydia has run of with an unsuitable army officer” (Greene, 2003). There is no mention as to why Mrs. Bennet is scouring for single young men, but only the expectation that her daughters must marry. By Greene adapting and simplifying the covers to presume a merely romantic narrative between Elizabeth Bennet and Mr. Darcy, she is constructing the novel Pride and Prejudice to appeal to a younger audience. 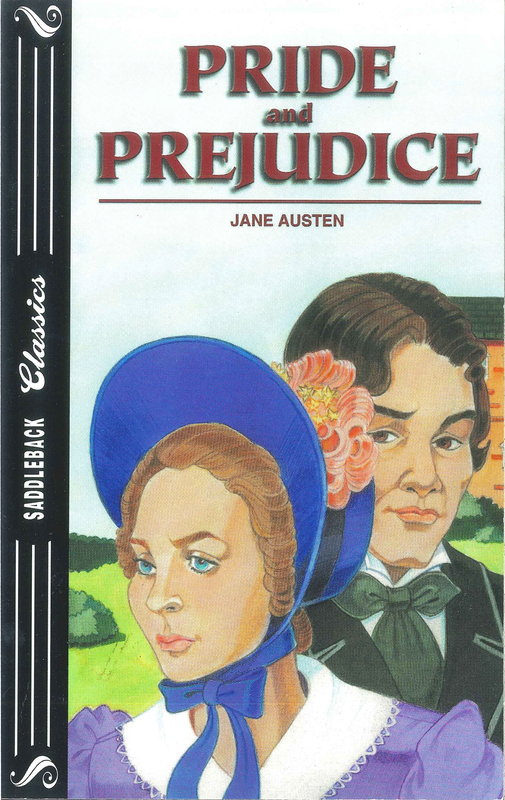 The front cover provided by the 2003 adaption of Pride and Prejudice is straightforward. Pictured on the front, there is Elizabeth Bennet and Mr. Darcy. In the background there is a slight glimpse of what is assumed to be Pemberley Estate among the countryside. Lizzy’s face is particularly unimpressed, as she is looking away from Mr. Darcy and has a slight frown as well as furred eyebrows. Mr. Darcy stands behind Lizzy, gazing down upon her, with one eyebrow raised in a quizzical fashion. They are both well dressed and presentable, yet give off a slight essence of frustration within their relationship. Upon first impression, this cover page indicates direct tension between Lizzy and Darcy. It can be assumed that the two characters are involved in a relationship, yet not necessarily a pleasurable one. It is a simplistic vision, and leaves little to the reader’s imagination, as much of what the novel is focused upon is laid out within their facial expressions. Likely, the illustrations are presented in an obvious way due to being a children’s variation. The large, one-dimensional font, with no adaptation note or press quotations leaves this version with a rather naïve and amateur composition. The front and back covers streamline the novel to be focused around the affiliation between Lizzy and Darcy, not primarily concerning the other family members, previous attempts at marriage, or desire for wealth. While this adaption markets towards Jane Austen’s everlasting virtues by promoting audiences of younger generations to aid it its timelessness, it loses part of Austen’s meaning by not showing or indicating the primary concerns of monetary limitations. The 2003 adaption’s first impression allows the novel to be portrayed as only an involvement between a singular man and a woman. This leaves behind the depth of the story that Austen initially offers, which lies in the relationships within the family and how they interact in times of unease. In contrast, the reflection the 2016 adaption is attempting to portray is the consistent parallels between money and marriage, “Oh! Single, my dear, to be sure! A single man of large fortune; four or five thousand a year. What a fine thing for our girls!” (Austen, pg. 3, 2016). Other romantic interactions could include Mr. Collins’ proposal to Lizzy, or Bingley leaving Jane to go to London, which results in Mrs. Bennet’s frenzy because the chance of long lasted comfort has now been decreased. By not incorporating the variety of relationships on the cover, this adaption is modifying Austen’s meanings and shortening them into only illuminating the relationship between Lizzy and Mr. Darcy, not how their correlation developed or the relevant impacts to the entire Bennet family. Though the many revisions of Pride and Prejudice prove that Austen’s adaptability and timeless qualities are in fact a virtue to her writing, important objectives throughout the novel are often modified to certain markets. These alterations are not reflected in the same ways as the original narrative understood them to be. 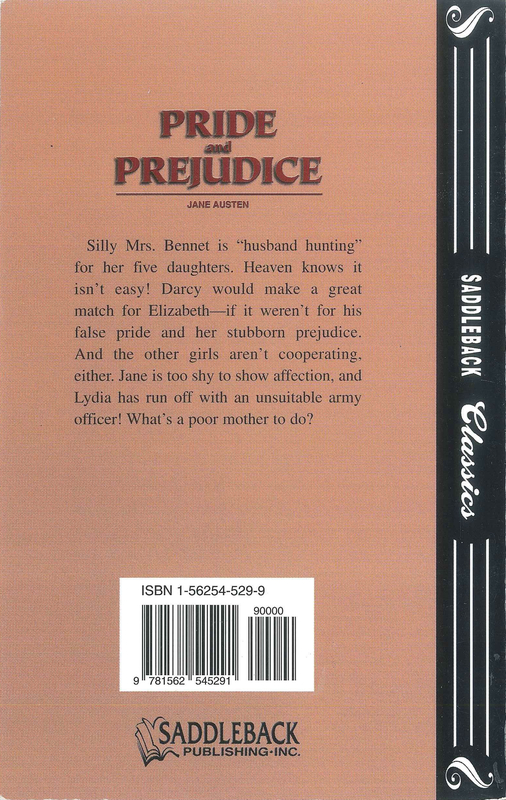 The 2003 Saddleback adaption is simplified down to the most basic format to promote Jane Austen to a younger age group. The first impression of this revision is that it is an elementary aged introduction to the world that Austen offers. Here it is hoped that young children will connect with the author in hopes of furthering their interest as they mature, continuing her timelessness throughout another generation. Other adaptions of Pride and Prejudice can be seen with more scandalous covers to promote intense love stories, or more architectural visuals (estates) to try to mask the romance. Though the novels have the same backbone and overall theme within the text, it is prevalent to note that they can be presented differently throughout graphic covers to appeal to a variety of audiences. Austen, Jane. Pride and Prejudice. Edited by Donald Grey and Mary A. Favret. Fourth ed., London, W. W. Norton and Company, 2016. Austen, Jane. Pride and Prejudice. Edited by Janice Greene, Irvine, CA, Saddleback Publishing, 2003.